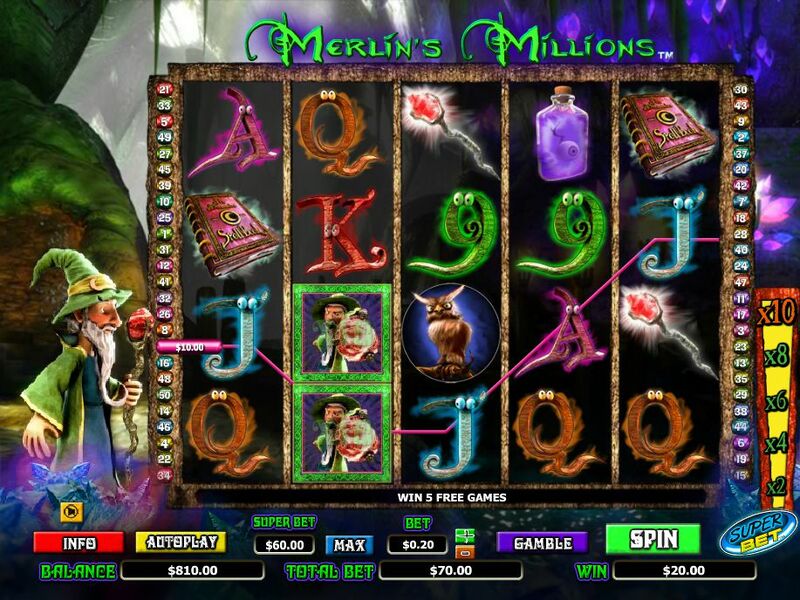 Where to Play Merlin's Millions: Free Online Slots for Real Money? While many of the most acclaimed slots out there are based on popular movie franchises, sometimes the discerning gambler prefers the theme of his slots to be based on myth and legend. 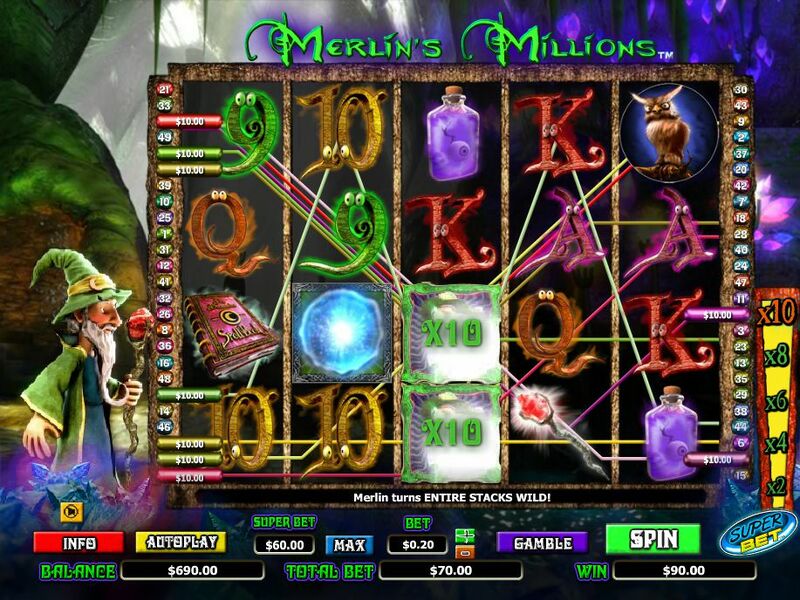 While there are quite a few of these slots out there, Merlin’s Millions developed by NextGen is one of the best known among them. While this particular slot doesn’t delve as deep into Arthurian mythos as, say, Avalon does, it does have some nice nods to the legend. Merlin’s wizardous antics take the center stage with this slot, as he often makes or breaks your luck when it comes to free spins. While the name is a nice bit of alliteration, you surely won’t be making millions with this slot - but there is definitely potential for some serious wins. 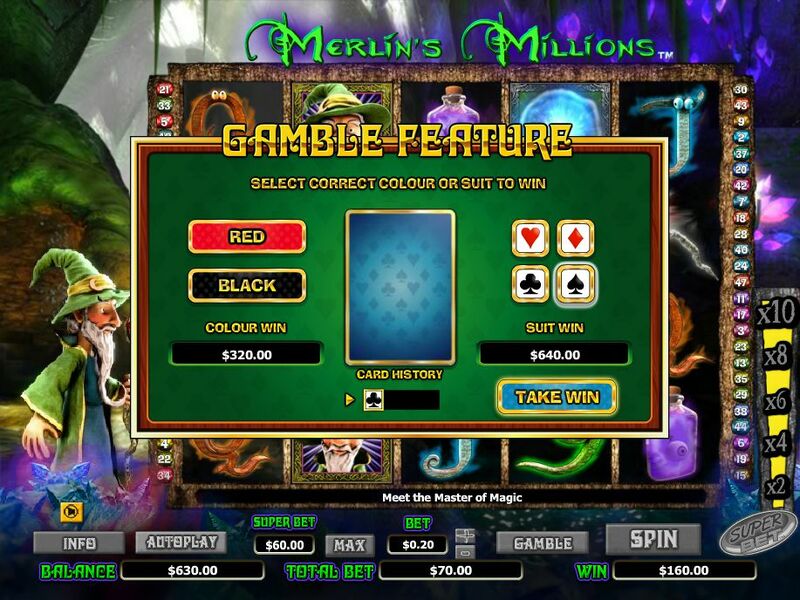 How to Play Merlin's Millions: Free Online Slots Casino Game? 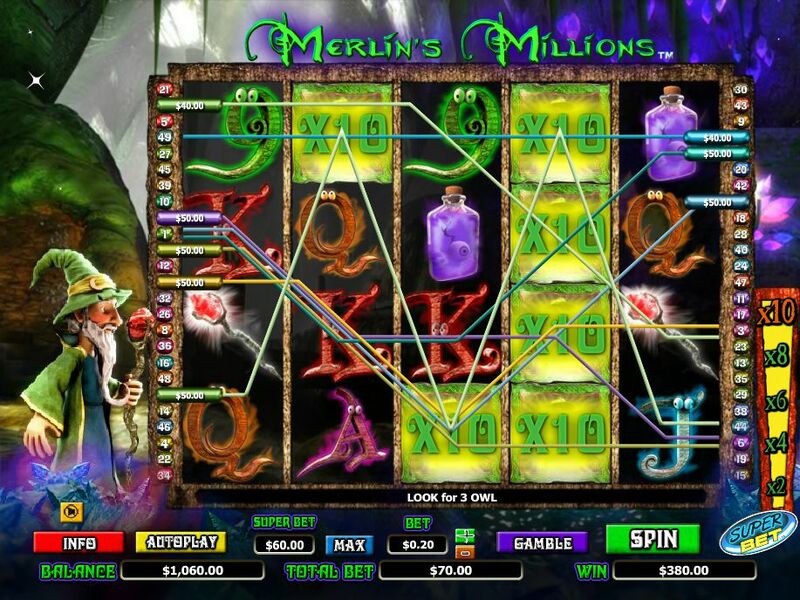 Merlin’s Millions is a 5 reel slot with 50 paylines, which is pretty standard. The individual payout on the paylines are pretty low, however - lower than your typical 50 line games. This changes when using the superbet function, on which we will expand later. The betting range for this slot falls between 0.5 and 175. There is a reason for that high maximum - while playing, we experienced that this slot really does cater to the high rollers. Betting small will leave you losing your money bit by bit, while betting big will return multiples of what you sat down with. In terms of visuals, it is clear where most of the budget went. While the interface itself it a tad bare bones and not exactly appealing, Merlin himself is present next to the reels in full 3D animated glory. He will congratulate you when you win, he will throw a small magical rave when you win big, and every now and then he will summon a magical sphere of energy in his hand which promptly blows up in his face. 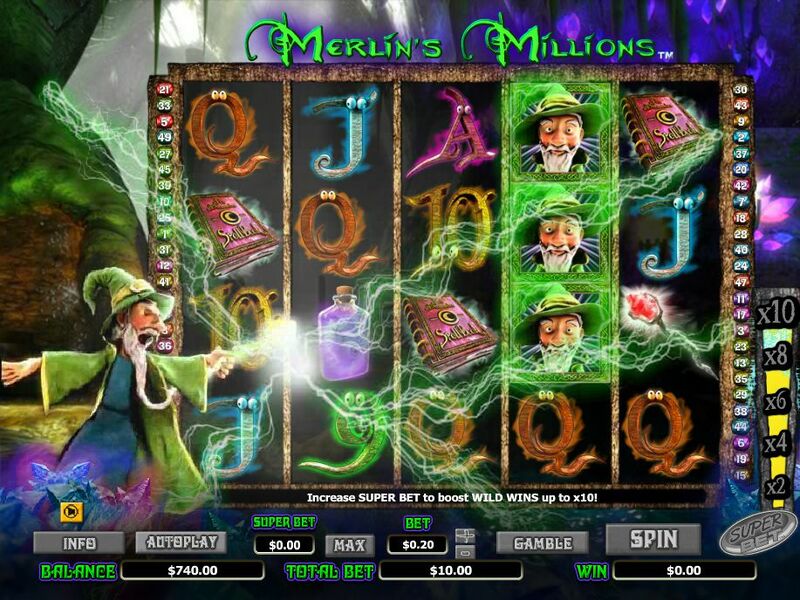 Merlin’s Millions has a few sweet play features added to keep you spinning. 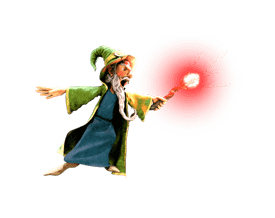 The wild symbols, which are portraits of the eponymous wizard himself, will show up on the middle three reels (usually in bulk). These wilds count as any symbol other than the owls and orbs, meaning that they can help you complete elusive paylines. The aforementioned orbs also show up on the middle three reels, and when you hit three of them, Merlin will reward you with 5 free spins. During these spins, he will randomly turn some of the symbols into wilds, further increasing your winnings during the free rounds. This feature is the most rewarding when used in unison with the superbet feature. If you hit three orbs during the free spins, you’ll retrigger the feature. The owl bonus is the most elusive one in the game, so much so that we’ve never encountered it. The owl symbol will appear on the first, third and fifth reel, and if you get one on all three, every single symbol on the screen will turn into an owl. Clicking these owls will reveal rewards under them, but you obviously won’t be able to bag all of them. Finally, what seems to be the most interesting feature is superbet. Activating this will increase you bet somewhat, however it also adds a certain multiplier to the wilds. With five tiers ranging from x2 to x10, when this is active, any completed payline that goes through a Merlin wild will have its respective winnings multiplied by the tier, as many times as many wilds it passes through. You can imagine how much of a game changer this becomes when used with the free spins. This once again depends on how much you’re willing to bet. Going low won’t provide you with too much excitement, as the only thing you will see will be your budget ebbing away. However, if you’re willing to risk more, you’ll end up with big winnings coming your way constantly. 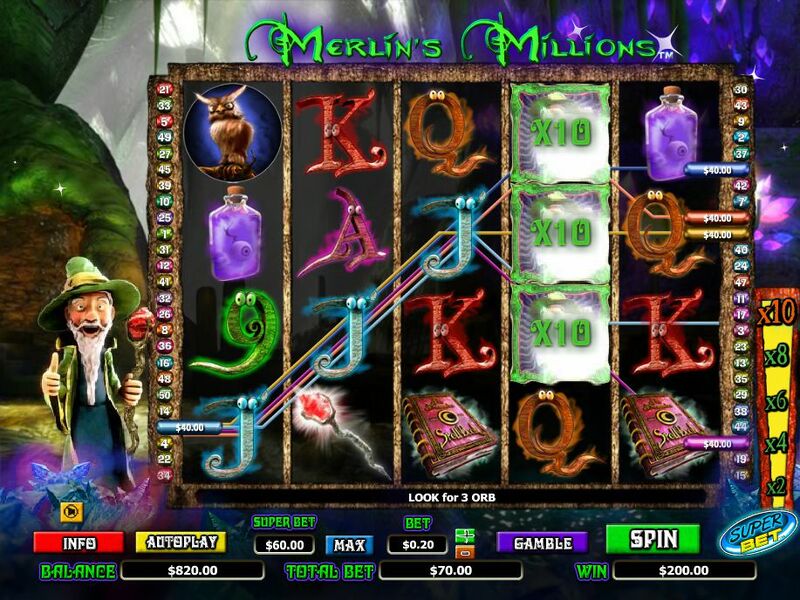 Merlin’s Millions is a really solid slots game, and has much to offer players willing to bet high. The superbet feature coupled with the free spins make this a great way to walk away with several thousand, as long as you’re willing to risk one thousand or so.